Imagine - her face lighting up when she sees you - opening a little wooden box, and you going down on one knee, in a perfect spot, with an utterly jaw-dropping backdrop of Edinburgh City, or an old Scottish Castle. And then, enjoying the moment for a few minutes, and then you point out the photographer in the distance, who captured it all on camera. The intimate moment, her smile, her surprise and the deep emotion, in a perfect place! Regardless if you are travelling to Scotland, or if you live here: there are so many beautiful spots in the city for popping the most important question! But a perfect outcome requires a little bit of planning, and that’s where I come in - your secret proposal agent! I have had the honour of taking photographs of several proposals and every time I was the "secret agent" on location, the person to ask for ideas, location suggestions, timings, weather and so on. A few things to bear in mind: If you want to have your proposal story captured beautifully on camera, get in touch as soon as you start planning. I can help you with location suggestions in or around Edinburgh, or even with a beautiful historic castle as a backdrop. If you are not familiar with Edinburgh, but have seen photographs, I can give you first-hand information about the locations. I have photographed proposals on Edinburgh’s Calton Hill, in Edinburgh Dean Village, and the Royal Botanic Gardens. When I planned a recent proposal for the end of December 2017 on Calton Hill, we arranged for a 12 PM proposal near the monument. The lovely now-groom from Boston, US contacted me months ago, and suggested Calton Hill. I sent him aerial photographs outlining the perfect spot for him and his girlfriend and where I would be for taking photographs. We then exchanged photographs of what we look like and a few days before the big day what we would wear, so we would recognise each other. 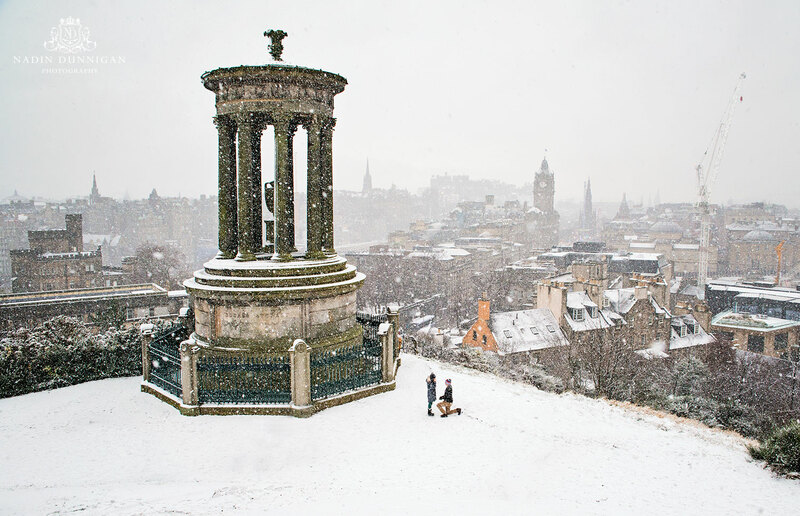 When I arrived on Calton Hill, it had been snowing heavily and for me the whole scene was just picture perfect (for photos of this, scroll down). The groom knew that my jacket would be bright reddish-brown, so I was sticking out from the dark winter coats everyone else was wearing. He actually stood beside me and admired the view with his girlfriend and we just nodded to each other while she looked towards the city, knowing what was about to happen. They then made their way to the agreed spot and they waited for a few moments for the people to disappear. And then - he got down on one knee, with her being totally oblivious to anything else around her! I met the couple shortly after she said “yes” and it’s just the most amazing moment to be part of such an important part of their lives. We had never met, but gosh the emotions, just priceless!!! They then enjoyed a glass of bubbly and I took some more photographs of the newly-engaged couple. My fiancé is my weather frog and to date, he has always been 100% correct with his predictions. He uses really scientific weather apps. A few days before the planned proposal, he knows exactly what the weather is like for a certain location for a certain time. So I knew that today at 12 PM it would be snowing and I had a big grin on my face!! Just perfect. I will of course keep you up-to-date with the weather predictions. However, should the weather for an outdoor open-air proposal prove to be really wet and windy, we should form a PLAN B before the big day!! The most popular spots in Edinburgh are obviously frequented by a lot of tourists. The way around this is to plan a proposal for mid-morning, when the tourists are still making their way around the city. So 10 AM is a good time. Or later in the afternoon. In summer, evenings are great too. I discussed with the Calton Hill groom-to-be the people situation too, as there are likely to be many tourists - in any weather! I told him that if there are too many people, to wait a few minutes until most of them have gone. Your girlfriend will not realise any people around you as the whole thing will hopefully be a total surprise to her. Everything will simply disappear around her!! I planned a proposal with a groom-to-be in Dean Village recently, and we decided on a certain spot, and we had a Plan B too. At the exact time, when he and his girlfriend were in the exact spot, they were suddenly surrounded by a group of about 15 tourists who all decided this was the perfect spot to take photographs. So even our 10 AM plan was knocked a little. He then made his way to Plan B location and went ahead with the proposal and it was still absolutely beautiful. Permission? What for you might wonder? When I photographed a proposal in the Royal Botanic Gardens, the groom asked me to prepare a heart of candles which he would lead his girlfriend into for popping the question. For this to be OK (so we don't get chased away) you would need to speak to the people managing the park. Edinburgh Castle offer proposal packages too in one of their special rooms in the castle. It's best to let the people know so everything will be OK on the day. Just say you have a private tour booked, and I am your tour guide. And if you want to be in touch on the day via WhatsApp or Text message, just save me in your contacts as Tour Guide. Talk about a guy who will meet you at a certain spot if you need a reason to go there. So she will not be suspicious if she sees a lady tourist standing around with a camera around her neck. None of the girls have noticed me whatsoever, even though they were in touching distance from me on almost every occasion. It’s best to hide in plain sight!! This is really true. I would love to be your secret agent and help you plan your proposal! What is your name? * AND YOUR EMAIL ADDRESS? * WHAT NUMBER CAN I CALL YOU BACK ON? * What date are you thinking about for your proposal? Any additional information / Location ideas?